VORONOI is a desk designed by the architects Jutta Rentsch & André Serpa from the ja-project studio based in Berlin. It is also a mathematical algorithm, a random set of points in a plane that are all contained in the same image, a special kind of decomposition of a given space. Each table is thus a place and a workstation where the resident creators can develop their own projects. The VORONOI project is a co-working space that supports self-employed, as well as groups of emerging talents and creative businesses. Aims to bring together a spectrum of self-employed workers, from a variety of creative disciplines in order to develop entrepreneurship and innovation. We will provide a space and a team specialized in management and production of projects to supervise all stages of development, even those who were presented in the embryonic stage. VORONOI is a Creative Particles Accelerator and also a “Virtual Enterprise”, able to respond to various challenges of the New Economy of Culture. An initiative by Galeria Luis Serpa Projectos in partnership with Aula do Risco, produced by O Museu Temporário and supported by Induscria_Platform for the Creative Industries. 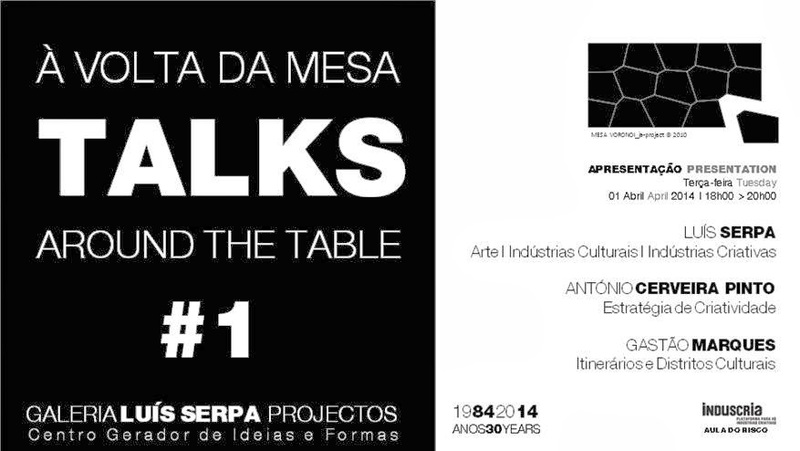 TALKS AROUND THE TABLE are weekly meetings around transdisciplinary themes on the areas of greatest interest to the creative industries: Architecture, Visual Arts, Performing Arts & Entertainment, Film & Video, Writing and Editing, Gastronomy, Fashion, Music, Publicity, Heritage, Educational Software & Leisure. In addition to the special guests, speakers are professionals and experts in key subjects for the development of creative business, resident workers and the general public. Rato > 706, 709, 720, 727, 738, 758 e 773. Rua da Escola Politécnica > 758 e 773. Metro Subway: Rato [estação terminal] Linha Amarela. Entrada pela Rua da Escola Politécnica, nº 231. Saída pela Rua Tenente Raul Cascais. Horário: Aberto 2ª, 07h30 > 22h00 | 3ª a 6ª, 07h30 > 02h00 | Sábados e Domingos, 11h00 > 02h00.